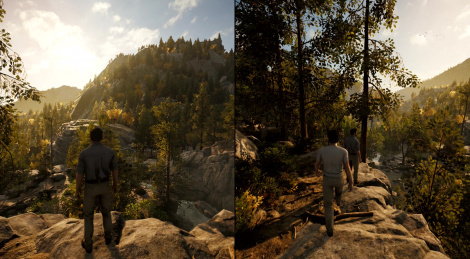 A Way Out got pretty good reviews overall, but the game has not been unanimously praised by journalists or players. The reasons why our coverage took so long to be put up is first that we had to buy our own PC copy of the game and secondly that we wanted to complete it first. It turns out that Josef Fares' new title is not as memorable as Brothers: A Tale of Two Sons, but it's still a nice co-op experience to share with a friend, provided you neither expect deep gameplay mechanics nor a revolutionary plot. The situations are quite varied but the way split screen is used could have been a bit more audacious, not to mention that some of the story bits could be considered as a form of laziness of writing. That being said, the 2 main characters are endearing enough and the plot does not take more shortcuts than say Heavy Rain. In the end, A Way Out may not be indispensable, but it's not especially disappointing when you don't attribute imaginary intentions to the game. Looks pretty cool, I will have to check it out. That is such a perfect summary of the game. Me and my brother had very good fun with it. I thought the videos were pretty interesting. I wonder if there could be a mod to have each player get a separate full screen. that would be a cool little mod for this game.